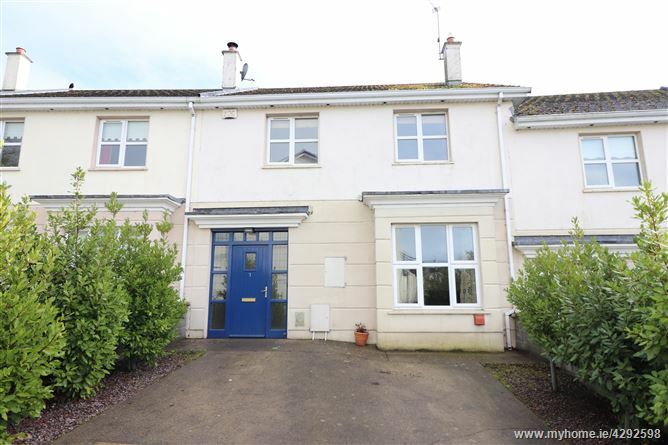 Rooney Auctioneers are delighted to present this fantastic 4 bedroom home located in the popular Castlerock area of Castleconnell. It is excellently located being close to all local amenities and all main motorways. This spacious home comprises of an entrance hallway with guest wc, spacious bright reception room, kitchen-dining room, utility room, 4 bedrooms, ensuite & main bathroom. GFCH. Rear garden. Carpets, blinds, light fittings, and appliances are included. Viewing recommended. Entrance Hall - 2.04m x 5.26m. Large bright hall with tiled floor. Guest WC - 1.87m x 1.66m. With wc, whb, tiled. Reception Room 1: 4.46m x 5.32m. Spacious bright living room with wood floor, bay window and gas fire. Double doors to kit/diningroom. Kitchen/Diningroom 4.52m x 5.34m. Bright open plan room with fully fitted kitchen and tiled floor. Double doors back to Reception Room 1. French doors off to rear garden & patio area. Utility Room: 1.66m x 2.95m. Fitted units with ample storage. Tiled floor. Back door off. Main Bedroom 1 - 4.42m x 3.61m. Large bright double bedroom with wooden floor and with built in wardrobe and ensuite. Ensuite - 1.60m x 2.43m. Tiled, wc, whb, shower with electric shower. Bedroom 2 - 2.81m x 3.39m. Bright double room, with wooden floor and built in wardrobes. Bedroom 3: 3.36m x 3.18m. Bright double room with wooden floor. Bedroom 4: 3.49m x 3.29m. Bright double room with wooden floor and built in wardrobes. Main Bathroom: 2.49m x 1.77m. With bath, wc, whb, and partially tiled. Travel from Limerick out the M7 to Junction 28 . At the Newport roundabout take the 2nd exit R445. Continue to the Castleconnell roundabout take the 2nd exit staying on the R445. 0.2km on take the left onto Belmont Hill and 0.4km on take the right hand turn into Castlerock Estate. The property is located on the right hand side.